Happy Vinayaka Chaturthi everybody! I hope you had a few moments to offer prayers to Vinayaka today; if not, the song I have chosen is a prayer in itself. But I am running ahead of myself. We all know that one prays to Vinayaka for the achievement of goals, for success. The word siddhi which we use to preface His name translates to exactly that. Who amongst has not demanded that Vinayaka help us pass our exams, get through that interview, get the promotion we are aiming for? I know even some people who claim to be agnostic sending up a ‘just in case’ prayer if the goal seems important enough! But these goals give us but momentary satisfaction, forgotten even as we set the next possible goal. I wonder, are we wasting the good Lord’s time by asking for things which are too easy to deliver? Should we not be setting Him some stretch targets? 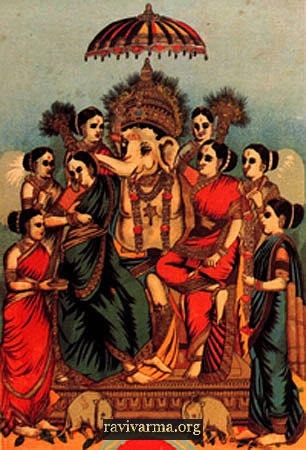 Vinayaka is also the Lord of the eight Siddhis (occult Yogic powers) referred to by Patanjali in his Yoga Sutra. These are indeed amazing powers! Vinayaka has the power to bestow the yogin with all of these occult powers. They sound rather dangerous, don’t they? Instead I think about the words metaphorically and I offer you alternate meanings to reflect upon. अणिमा aNimA : The ability to concentrate such that we can focus our mind to a pinpoint. महिमा mahimA : The ability to have such a broad world-view that we can encompass all. लघिमा laghimA : The ability to let go everything, all maya, so they we are weightless. गरिमा garimA : The ability to absorb all challenges we face with the stability of the infinitely heavy. प्राप्ति prApti : The ability to stick to an objective until we achieve it. प्राकाम्य prAkAmya : The ability to empathise so well with others that we virtually transmigrate into them. ईशित्व Ishitva : The ability to create beauty and joy. वशित्व vashitva : The power to rule over our weaknesses, to control our needs and subdue our passions. Now, these siddhis are worth praying for, don’t you think? My song today is addressed to Siddhi Vinayaka, set to the beautiful raga Shanmukhapriya (Chamaram) and composed by Muthuswami Dikshithar. It is a song of praise, reminding us that He is the bestower of whatever we desire. The Yogic theme for today was inspired by the words reminding us that Vinayaka is present in the Mooladhara Chakra, that which much be awakened if we are to reach a higher state of being. For lyrics and translation, see footnote below. I could not look past Pattabhirama Pandit for his most energetic and creative performance (Alapana and Kriti). He is accompanied by Mysore Srikanth, H.S.Sudhindra and Giridhar Udupa. If you have a taste for more, check out this lovely performance by MDR (item 7) and another very good one by Sumithra Vasudev (item 2). I (aham) incessantly (anisham) meditate (chintayAmi) upon Siddhi Vinayaka. He is the Lord (nAyakam) of the famous (prasiddha) Ganas, the foremost (varam) bestower (dAyakam) of the specific (vishishTa) object of desire (artha). He is worshipped (sEvitam) by Siddhas, Yakshas, Kinnaras etc (Adi). He is renowned (prasiddha) in the whole (akhila) world (jagat). He is in the middle of (madhyashtha) the lotus (pankaja) of Mooladhara Chakra (mUla). He has the Modaka sweetmeat in his hand (hastam). He is worshipped (pUjitam) by the Brahmanas etc (Adi) on the fourth day of the lunar cycle (chaturthi) of the month (mAsa) of Bhadrapada. He is the holder (dharam) of a noose (pAsha) and goad (ankusha). He is cooled (parivIjitam) by an umbrella (CHatra) and a chowrie (chAmara). He is devoid of (rahitam) violent or angry (raudra) emotions (bhAva). Who is resplendent (virAjita) in the hearts (hRdaya) of his servants (dAsajana). He is praised (architam) by Krishna (the younger brother (anuja) of the son of Rohini (Balarama)). He is without (varjitam) of desire (Iha). He is the grandson (sutAtmaja) of king (rAja) of the mountains (adri). He is the elder-brother (agraja) of the eternal (ananta) Guruguha (=Kartikeya). His are the lotus-feet (pada ambujam) which bestow (prada) welfare/prosperity (bhadra). He is the four-handed one (chatur bhujam) who dwells (mAnam) in lustre/light (bhAsa).